If you’ve been diagnosed with any of the above conditions, or if we can validate disc thinning in your X-ray imaging, you may be a good candidate for this cutting-edge therapy. This approach is noninvasive and painless; many patients actually fall asleep during their treatment. It works through the use of motorized traction that gently stretches the spinal elements. The spinal changes that occur take the pressure off of the nerves and discs causing disc material to retract. These improvements help to promote the flow of water, oxygen and nutrient-rich fluids into the discs so that they can heal. You’ll be fully clothed as you rest, either face down or face up, on a computer-controlled table. We’ll fit you with an orthopedically designed belt that’s placed around the pelvis and upper body for lower back issues, or, a comfortable strap that fits across the forehead for specific neck problems. Individualized time settings, although most treatments are 15 minutes in length. We’ve found that this remarkable therapy even helps those with carpal tunnel syndrome. We also want you to know that you’re always in control of your treatment. Although we’ve never found it necessary, each patient has full access to a button that will shut off the table and all treatment protocols. 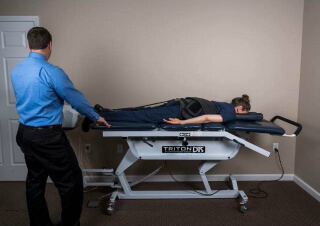 Spinal decompression can help the agony you’re experiencing in your low back, sciatica, or the pain shooting down your neck and arms. This safe, effective treatment addresses the cause of your problem in a gentle way. We love its technological efficiency for those in pain. Please let us know if we can answer your questions; we want to help. Contact us today!